Raising and House Training a Puppy while Working Full Time – Is it Possible? If you think that raising a puppy while having a full-time job is hard, I completely understand. We all know that pets can bring a great happiness, but it also comes with many responsibilities. From the moment we decide to make them part of our family, we create a bond of trust and endless love that we should value. Nevertheless, many people resist the impulse to become dog parents if they have a 9-5 job. Most think they won’t have enough time to give her the love she deserves, or provide her with adequate training to help her develop good behavior, manners and, also controlling the separation anxiety during long working hours, instead of taking it back against your shoes. There are mixed opinions on the dependence and independence of our pets. There are those who think that a person dedicated to their work would be better off adopting a cat, some argue that certain breeds of dogs are more independent and enjoy their time alone almost as much as the time they share with their owners. There are of course those who will say that it is impossible to have a puppy if you are not home all the time and that it may be more convenient to engage in gardening, or perhaps acquire a goldfish. However, working doesn’t mean giving our pets less love or giving them fewer opportunities. It only implies that they will possibly have a lifestyle different from that a farm dog, or one adopted by a large family with many little children. In all homes, the dynamics are different, just as there are homes with single parents that provide all the stability and care that kids require developing fully, the home of a working bachelor can be an excellent source of love for a dog. If you are having second thoughts, don’t feel discouraged by people comments, on the contrary, consider the tremendous impact you could make on the life of that abandoned puppy who’s waiting for you in the closest animal shelter. Of course, we can’t deny that it can be a challenge. But if you dedicate quality time each day, and manage to prioritize, you will find the time and energy, to carry out the commitment to impart to the puppy the education he needs by, in the first place, giving him the opportunity to be in a loving home. It doesn’t matter what kind of job you already have. You still can manage your day-hours to have time for everything that’s important to you, as it will be your new puppy. Nevertheless, you should be aware that “accidents” will occur when you’re out of the home, either if you are working or buying groceries while training a puppy or a more mature dog, it will take some time to get familiar with a new place. Things like chewing the sofa or peeing on the carpet, tend to occur due to the separation anxiety and lack of training. Those “adorable surprises” that greet you when you open the door, and he’s jumping over a pile of toilet paper, excitingly showing you her master piece, can also involve dangerous things like wire chewing or swallow objects with the risk of choking. How to Help You and Your Pet While You are Stuck at Work? Loneliness can be the sad part of this story, but if you get creative, you’ll manage that. It would be best if you take some days off your work, or make the adoption process matches with your next vacations, to train your puppy on how to “be alone”; this means you have to teach your little dog to stay at home without you gradually. This way it won’t be a shock to be left alone, and you’ll prevent the howling and barking which lead us to the next tip. Excessive howling and Barking is a direct effect of being alone. You kiss your dog goodbye, and he stays at the door asking herself why did you go away and when are you coming back. So it shouldn’t be a surprise that your puppy reacts to this by howling and barking the sad song that has a chorus more or less like this: “Where are you? I feel so alone when you’re not around, come back please”. You will not want this if you have close neighbors. Try to Understand; dogs howl when they feel their herd has abandoned them when they think they were left behind. If you reassure your dog it will realize that your absence is momentary, the howling will get more and more sporadic until it disappears. Leaving pieces of clothing with your scent can be very useful to help you manage the temporary separation, as it will make you feel that you’re close protecting them. Also consider a puppy sleeps most of the day, up to 18 hours daily, so he/she will need something extra-cozy to sleep. We know you’re hype with your new puppy but don’t let that get to your head! It’s bad to give your puppy the idea that you’re going to be there 24/7. It has to learn how to be independent. Give her space, maybe use a crate so that she will have her own “den.” Use the tips above to make a friendly environment in which a single pet can have fun on its own! Treat cams (Petzi, Pawbo, Petcube, Furbo, etc.) that allow you to sneak out for a brief moment while at work, see your puppy and even give her a treat! Plus, they become excellent tools to keep an eye on your beloved furry babies! And reduce our separation anxiety. Countless chewing toys: Dogs developed a real addiction with this type of toys. Not only fills them with joy and distraction but also encourage and benefits teething. Try with a “Kong” type of toy or other treat dispensing toys. Get creative but always make sure they are safe! Since some toys can break and their parts, when ingested by the puppies, could cause intestinal obstruction, irritations or cause suffocation. Of course, don’t allow your pet toys like ball throwing machines without supervision. It can quickly become a mess. Yes! Daycares are not only for human children. In these spaces created specially to suit all the amenities and needs of our precious furry friends, the puppies can socialize and discover the world is full of things that live outside their house. Other pets, other people, other toys! Imagine the possibilities. They can train with an expert, and they’ll go back home exhausted. Pick an excellent day-care located right on your way home or close to work. Check the staff; you don’t want to leave your furry baby in the hands of someone you don’t trust. Inspect the facility and make sure it’s clean, comfortable and safe. Day-cares might be expensive but think about the pros and cons of it. It may be a sound investment for your puppy’s happiness and help you make your mind about leaving him alone all day. If you think about it, Enrolling him in a dog daycare is, in a way, a routine that will bring as much or more joy to your dog than spending all day alone in a department floor. You can also find kind and responsible people that work as Dog Caregivers and will help you keep an eye on your puppy. Pet-sitters and family can drop by and check everything is okay or even take the dog out for a quick walk during a hard work season: the end of a project, a double shift, or a business meeting. That puppy is waiting all day to see you again, and she will be the happiest animal just to spend time with you. Throw the ball, pet her, and go for a walk. Playing a few minutes a day together will be priceless and an excellent use of your spare time. Being a dog lover surely you’ll miss your pet during work hours, a simple walk in the park Strengthens the bond of trust between you both, will reduce his destructive behaviors and help him drain energy. By walking your dog, you will also relieve stress by clearing your mind, it will help you socialize with your neighbors, and due to changing perspectives you might end up even focusing better on achieving your work goals. Because of having a full-time job and being away for so long you’re going to miss out training opportunities in which you could start teaching your puppy how to behave. Nevertheless, this doesn’t have to be the end of the road and creativity will save you again. Dogs react very well to routines, they are very simple creatures, and if we’re a patient and constant, we can teach them everything. Try to make a habit out of walking in the park, food hours, playing and potty time. Use these routines to make your puppy feel loved. Brushing her hair, playing and giving her lots of kisses and hugs should be part of your daily puppy-routine! The most important question that comes up is: “how to potty train a puppy when you work full time?” Our dogs are so, so tiny, they can’t control their bladders, and you don’t want a full grown up dog doing her business all over your house, right? The puppy stage is perfect if you want to start this training. The potty time can become a good habit through a routine. For this, you will need to take specific hours of the day to take the puppy out and wait until she does her business. Make sure you always pick the same spot, that way she will link the place with the potty time. Never miss any opportunity to teach spoken commands like: come, here, good, no. You will also need to become an authority in the puppy’s life, and she has to respect you and be obedient. You can even hire a personal trainer for your dog that will help your pet learn about socialization and submission. Fun and more fun but safety first! Things to think about before bringing the puppy. Having a puppy is just like having a baby. You have to be prepared and make your home puppy proof! Make sure there is nothing reachable for the pup to eat and chew. Little things that can be ingested, dangerous stairs, opened doors or windows. Making your house safe is a matter of common sense but always try to research and learn more about safety. Work with security locks and little fences to prevent your baby dog from falling on the stairs. 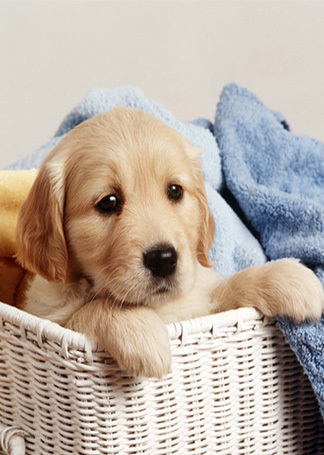 It’s essential to know what to do if your puppy gets sick or has an accident. Having the emergency vet’s phone or knowing “where to go” will save you from disgraceful situations. Learn how to do the Heimlich maneuver and consult your vet about everything, remember the vet is there to help you and your pet. If a particular food is meant for human consumption, it doesn’t mean it’s good for your pet. Things like avocado, onion, garlic, sugar, alcohol and more can be devastating for your dog’s health. Avoid giving your meal leftovers to your pet; this is a counterproductive habit. Puppies are very likely to get distracted, so letting them go out alone sounds like a crazy idea, right? They could chase another animal or object and get lost or injured. If you have a large yard consider installing invisible fences which could save your pet’s life at some point. Leaving your puppy in a crate while you are at work all day can be an excellent idea because they can keep the puppies from injuring themselves or destroying your home. Nonetheless, can be lonely and painfully small for your new friend. They increase the feeling of loneliness and the lack of freedom to explore and stretch the legs, and if they don’t go out much, they can get used to standing in their poop and pee. If you’re taking this option in consideration, inform yourself first. 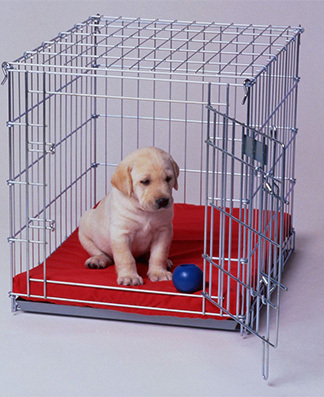 Puppy pens, for example, are an excellent alternative to crates because they are bigger than crates and you can keep things and toys inside for your pets amusement. If your pet is a chewer make sure to use indestructible beds unless you want to come home with torn pillow remains. Since we’ve discussed the challenges and methods for house training a puppy while working full time, let’s take a moment and see some fantastic benefits for you and your family. Puppy Love: Every morning you’ll receive a well-deserved dose of happiness and love, also known as “feed me and give some love! It’s time to wake up!” call To some people this could result exhausting, but those who live alone usually found this like the perfect excuse to wake up in a better mood. Low Blood pressure: Whether you are a hard worker who’s training a puppy, or you work from home as a freelancer who owns two older dogs, the mental health benefits are the same for every dog owner. According to Stanley Coren, he says that accepting and giving affection to a dog can improve our mental health. According to an article published in psychologytoday.com by Coren, it has been 30 years since the publication of a study by Alan Beck of Purdue University, and a psychiatrist, Aaron Katcher of the University of Pennsylvania. Their results indicate that when having a dog can reduce blood pressure, slow down heart rate, breathing became more regular and muscle tension relaxed-all of which are signs of reduced stress. Help you fight depression: Finding purpose and meaning in life can often be a daunting task. Repetitive work, routines, and the lack of significant social connections often lead to bouts of depression. However, the presence of a dog in your life will help you maintain a life full of novelty and activity, will force you to establish links with the outside world and, more importantly, it will love you, no matter what. Previous articleCan Dogs Have Watermelon? Yummy Summer Treat or Poison? What Is The Best Place For a Dog Crate? Great article. Housebreaking a puppy and working full time at the same time can be DONE. Worked thru all my furchildren when they were puppies. Puppy proof a room sized area with a baby gate, newspaper or pee pads. Leave pup a sleep pillow or pad, leave something like a t-shirt that you have worn so it has your smell. Food and lots of water. Safe toys. When gets paper or pad wet or there is feces. Praise praise praise. Don’t dwell on the accident s. Love and snuggle pup as you take outside. Your pup will most usually be come part of your soul. Make it all enjoyable.